It’s Pumpkin Season in Arkansas! It’s the most wonderful time of my year, no, not Christmas; it’s pumpkin season! The days are cooler (hopefully), the sun is setting earlier, and I am ready for all things pumpkin. To kick off the season, we like to visit some of our favorite pumpkin patches like Roseberry Farms in Benton and Pumpkin Hollow in Piggott. We always come away with our fair share of pumpkins from the patches, now, what do I do with all? 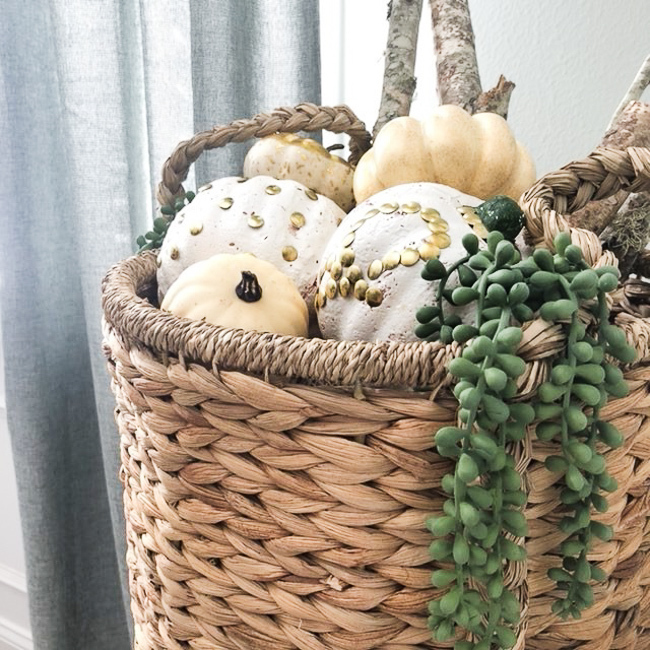 I’ve rounded up Six Fun Fall Pumpkin Ideas that you can use for decorating this season. Pumpkins make great fillers. 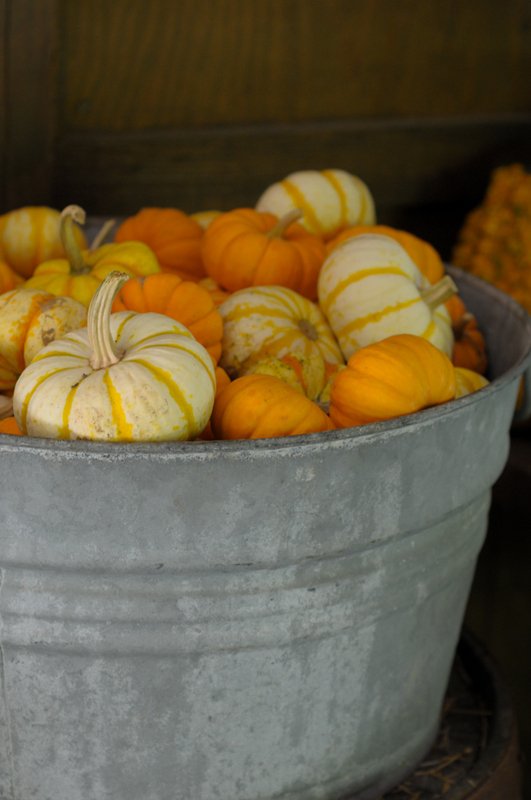 Check out this vintage bucket filled to the brim with pumpkins. Want to know a little secret? If you have a large vase or tube, fill it with anything you may have on hand, stacked books, floral Styrofoam, towels or blankets. Then place your pumpkins on the top to create the appearance of a full bucket of pumpkins but without the expense. 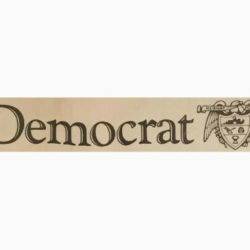 These are great for corners, fireplaces, front porch or a table centerpiece. Also, check out the delicious Crockpot Pumpkin Butter and Crockpot Apply Butter recipes from Heather’s Dish. This is a fun craft from Arkansas blogger Shea Fogerty to do with the kiddos this fall. 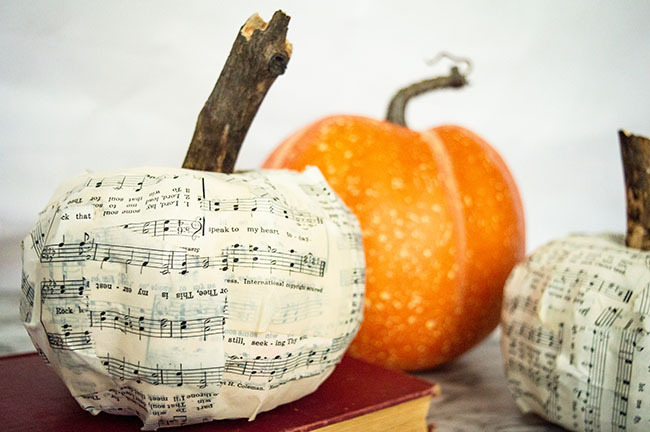 These papier mache pumpkins have used ripped music sheets to cover the entire pumpkin. You could use any form of paper for this project, but I’m a sucker for vintage books. Then, pop the stem off and added a stick to give it that rustic flare. Wanting to tone down the bright orange? I love to use chalk paint for so many projects. It’s easy, and it’s forgiving. Plus, you don’t have to prime. Pumpkins are another unique piece to paint. 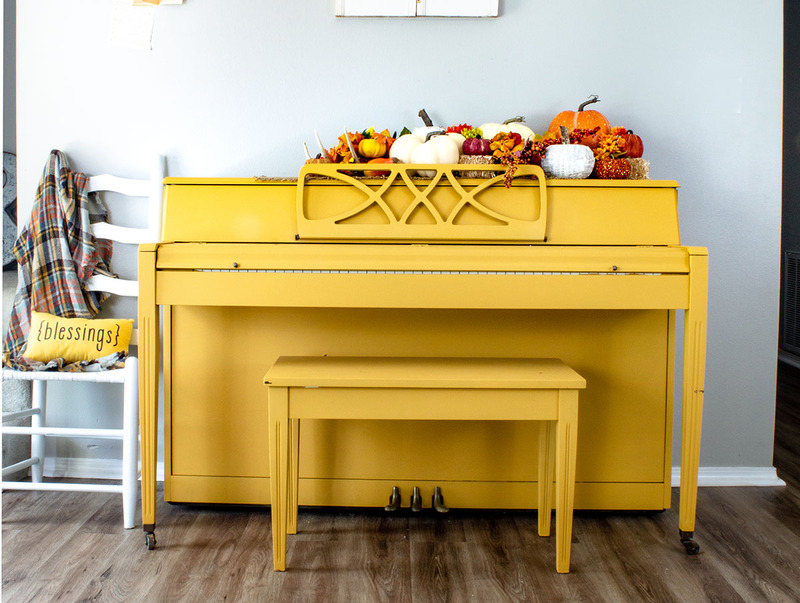 The matte finish it gives the pumpkins helps you turn your bright orange into a fun muted neutral which is on trend this season. Try going for whites or soft blues and greens. 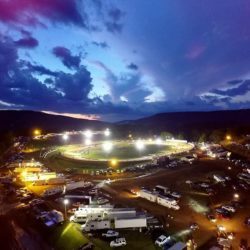 Photo courtesy of Jones Sweet Home. Here is another clever idea to take those pumpkins up a notch, use gold colored push pins to create any design on your pumpkin for a bit of bling. 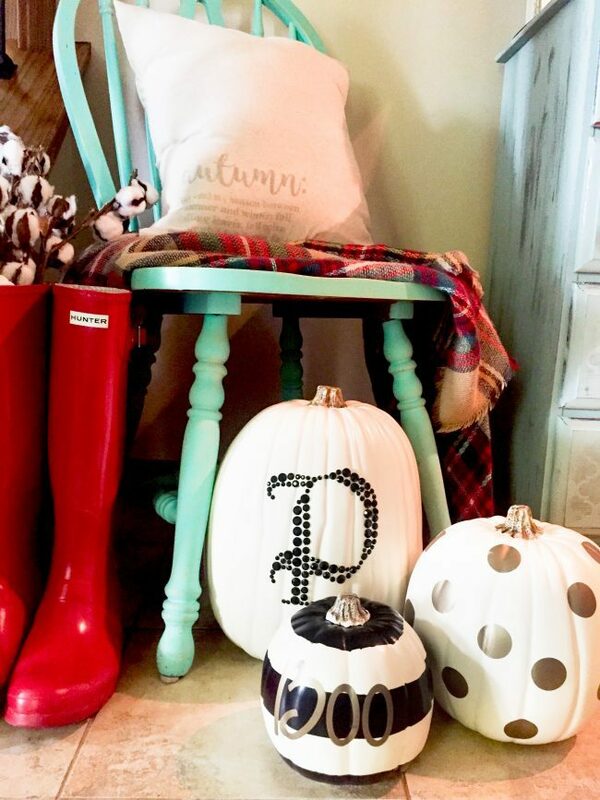 Pumpkins are great a way to monogram or display your home address. Speaking of monogramming, if you’re handy with the vinyl machines, using your pumpkins as a fall sign is another crafty idea. You could display Boo, ampersands, or your street number on a regular sized pumpkin to create a festive front porch vignette. With vinyl, you could even create a jack-o’-lantern face without the muckiness of carving an actual pumpkin. Photo courtesy of Desperately Seeking Gina. Not in the mood for real pumpkins? Another fall pumpkin idea is this fun and crafty faux hoop pumpkins from Desperately Seeking Gina. 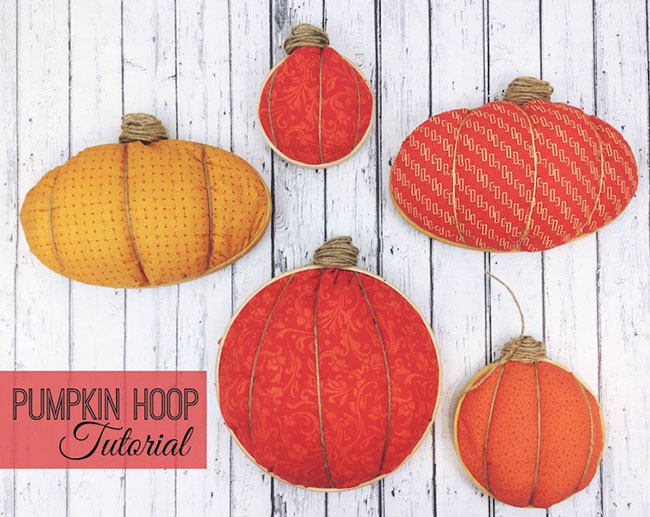 She used hoops and fall colored fabric plus twine to craft these fun pumpkins. These would be cute if you needed a pumpkin wall display or a door hanger. This fall head out to one of your local pumpkin patches and have a grand time. Before you leave, grab an armload of pumpkins and get your craft on! You’ll be the envy of the neighborhood this October. Happy pumpkin hunting! 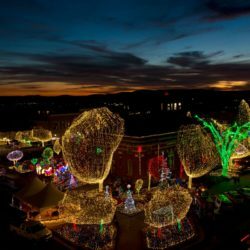 Arkansas Women Blogger member Shea Fogerty was born and raised in a true 'Joanna-Gaines-eat-your-heart-out' farmhouse in rural southwest Arkansas. 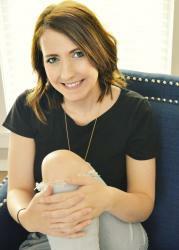 This is where her passion for simple living and DIY decor was born. 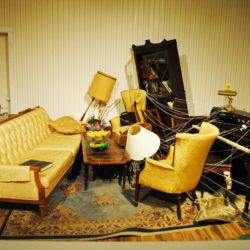 Today, she is blogging all about her adventures of recreating her faux farmhouse on her blog The Fogue Abode. 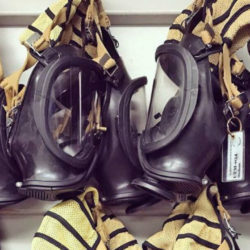 You can usually find her each Saturday, wrangling her two kiddos, on Instagram @shea_thefogueabode where she Stories her way through her latest project.